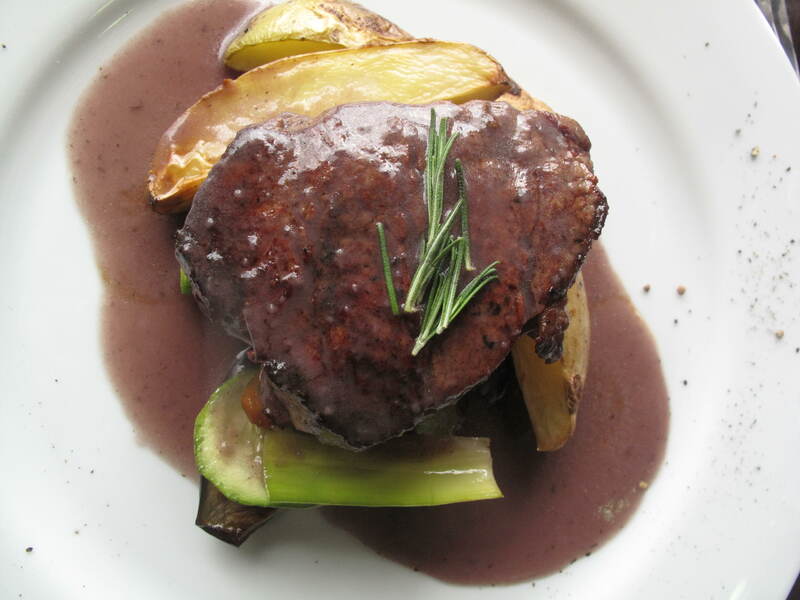 In Venada Tuereto, Aregentina – Where’s the Beef? This used to be a cow pasture, now it is a corn field. 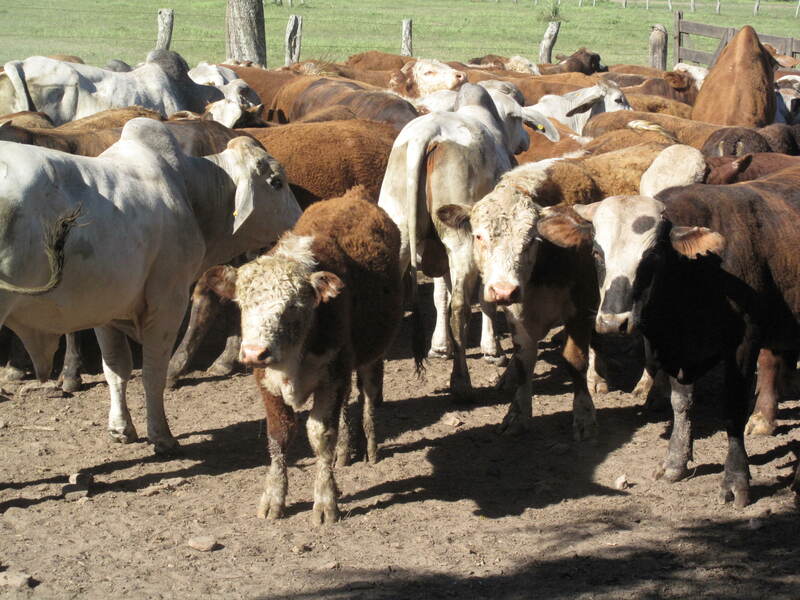 In the pampas (one of the most famous cattle production areas of the world) cattle are increasingly being replaced by commodity crops: corn, soy, and wheat. After attending the Angus Centro cattle auction in Rio Quarto, Alejandro and I drove East toward his home in the working class town of Venada Teureto. We were driving through the heart of the Pampas, which I assumed would be lush with grass and full of cattle, but instead the scenery resembled the endless flat cropland of Kansas or Iowa. In a country where the average citizen eats an average of 150 pounds of steak a year, I wondered where were the cows? Alejandro’s own herd of cows were several hours away in the province of Cordoba, but he rents fields on a defunct cattle ranch near Venada Tuereto where he crows corn, soy, and wheat. We took a small detour so he could show me his crops. As a farmer trying to provide a comfortable living for his family he grows crops near his family’s home in Venada Tuereto, where his children can attend a private school and keeps his cattle at a separate ranch as much for pleasure as for business. This is what the future of farming looks like. 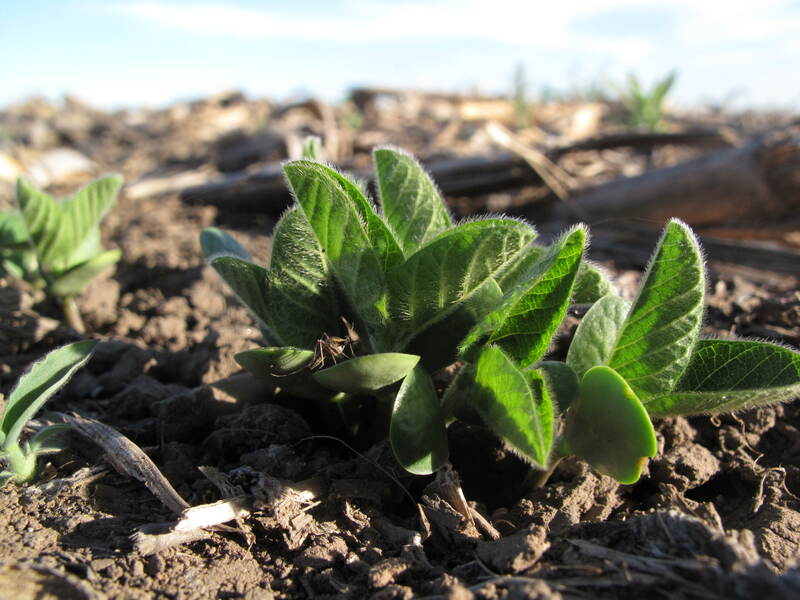 A young soy bean plant growing in the field. The farm Alejandro rented was a little ways from the highway and its entrance was blocked by a gate with a large padlock. 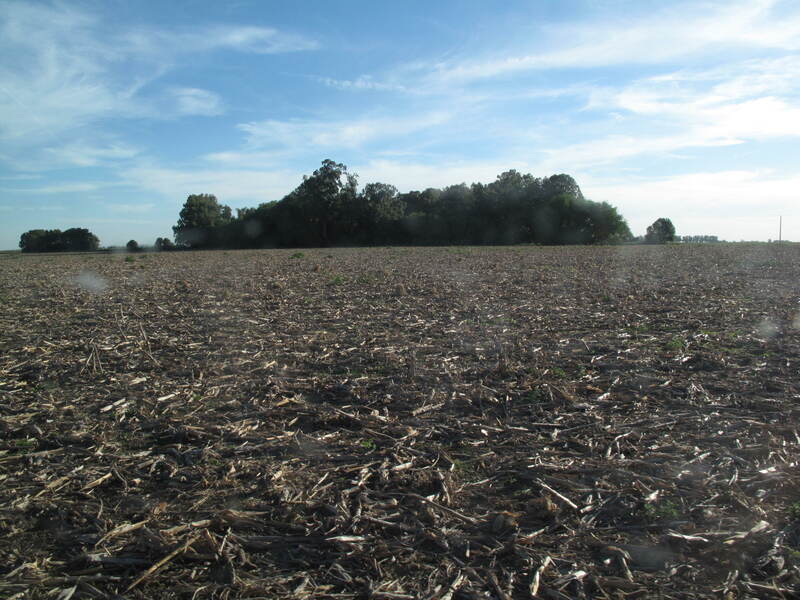 Alejandro opened the gate and turned off the farm’s road onto a field of young soybeans. He was surveying the young crop, looking for signs of stress anywhere in the field. He stopped the truck and we got out and looked at the plants that looked similar to another legume I was more familiar with, alfalfa, which is a common horse and cattle feed. The soybeans growing in this field might also be used as cattle feed, part of the change in the beef industry in South America, where fewer cattle are raised and finished on grass. In Argentina and Brazil, cattle are becoming raised in a more “modern fashion” spending the first six months to a year on a ranch, and then moving to a feed lot where they are fed protein rich corn and soy beans to make them gain weight quickly – called “finishing” in the industry. This is the same method used to produce beef cattle in the United States. Also like the United States, this grain sold to feed lots is subsidized by the government, ensuring the price of beef remains cheap. Alejandro, inspecting his wheat field. We hopped back in the truck where an insane number of enormous mosquitoes had settled into the interior of the cab. We drove through the corn field, trying to look at the young stalks of corn while swatting away. Large hares darted out of the way of our truck. Their burrows were well established in the field and are rarely disturbed because the soil is rarely turned over in the field. 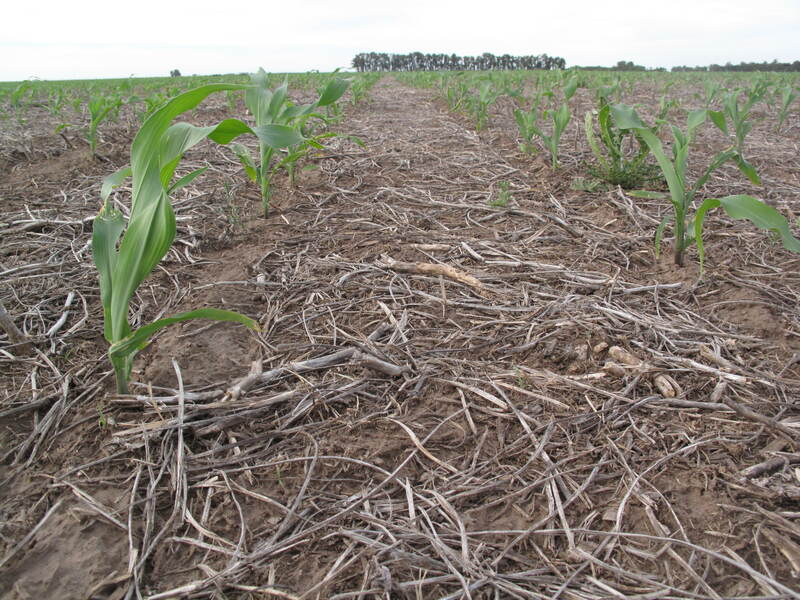 This method of farming is called “no-till” or dry land farming. As it’s name suggests, in no till farming the field is rarely plowed, instead seeds are planted with a mechanism that inserts the seeds directly into the dirt. The dead roots from the previous years’ crops help keep the soil in place, which limits soil erosion, as well as providing an organic material whose decay will fertilize the new crop. This also maintains the health of the soil as an organism (see previous post on biodynamic farming) and lessens the amount of Carbon Dioxide (CO2) that enters the atmosphere – disturbed soil emits the Carbon Dioxide that decaying plant mater sequesters under ground. Because the soil is generally healthier than no-till farms, less nitrogen fertilizer is needed, which makes for less nitrogen run off (a huge problem in the United States), but chemicals are still used to manage weeds and other insects and plant diseases that follow in the wake of any monoculture enterprise. Instead of gauchos, horses, and leather lariettes used for Argentina’s traditional cattle production, chemicals are the tools of commodity crop farming. In general dry land farming has less of an impact on the ecosystem than till farming while achieving comparable yields. 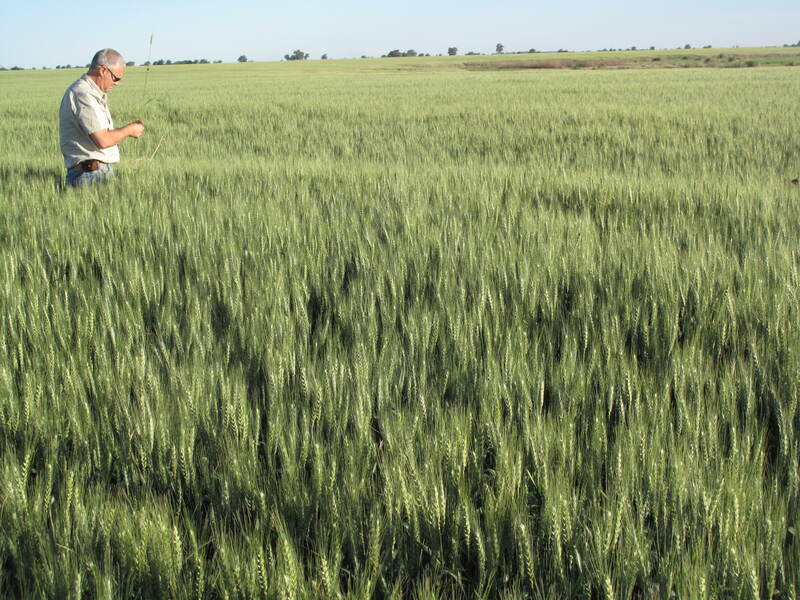 This was evident by looking at Alejandro’s wheat crop, which looked to have a promising yield – the stalks were large, lush, and densely concentrated. But it would only be a good harvest if the weather cooperated. They had been having a dryer than normal spring. Once the wheat was inspected, we turned the truck around to leave. Alejandro pointed out the abandoned farm house, which was not visible behind the fortress of trees and shrubs that had been planted years ago for shelter, shade, and beauty. At one time that house was the epicenter of a large cattle ranch. There were probably several abandoned buildings behind those trees – barns, tenants’ quarters for the farm hands, and a house big enough to contain a large family. It is common that people in these rural communities come from families of six or more. Alejandro himself comes from a family of eight children. The sight of abandoned estancia house is not uncommon in this area. Even if people have decided to continue their family tradition of farming, they may choose to live in town where they are closer to good schools and more employment. Much like the states, many farmers need more than one income, so they have a second job or their spouse has another job. Alejandro’s wife, Carolina, works in Venada Tuereto as an office administrator. The shift from cattle farming, where large crews of gauchos were needed to tend the cattle, to crop farming, where one person can do most of the work with large machinery, has also changed the face of farming and the way rural communities are structured in Argentina. Once a bustling cattle ranch, now behind these trees resides an abandoned estancia house. The shift in livelihood from cattle to grain is noticeable everywhere in the community. From the road many fence lines are strung with banners which identify the type of crop being grown, the specific variety of seed used, and which company supplied it. Multinational companies like Monsanto sell these patented seeds to farmers many of which are genetically modified organisms (GMOs). 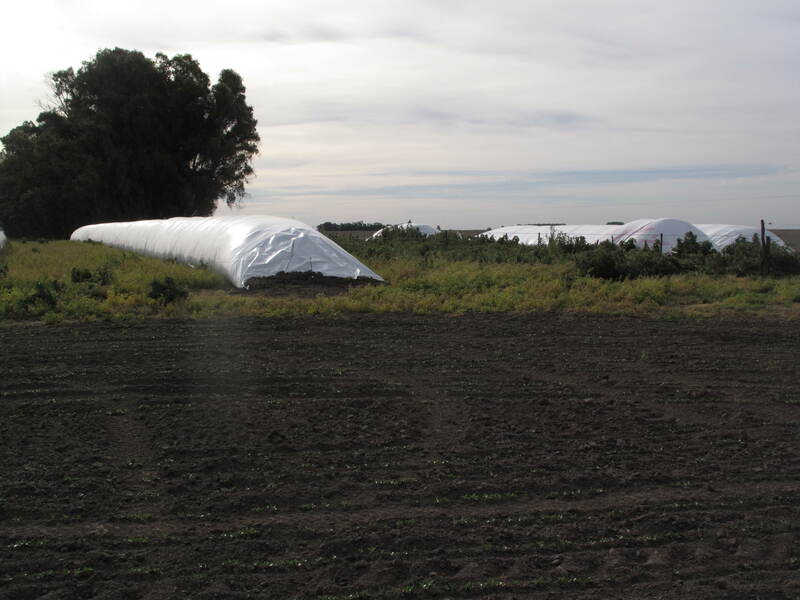 Alejandro’s own beautiful home, just outside of the city, is near a large complex of metal buildings which store seeds for an agriculture company that is a subsidiary of a multi-national agriculture company – a new neighbor in the last ten years. Carolina is also an office administrator for a company that is a subsidiary of Monsanto, which has become the largest multinational agriculture company in the world. As cattle farmers and commodity crop farmers, Alejandro and Carolina were the perfect people to explain to me why in the heartland of the most famous cattle producing area of the world I was hard pressed to find a cow. 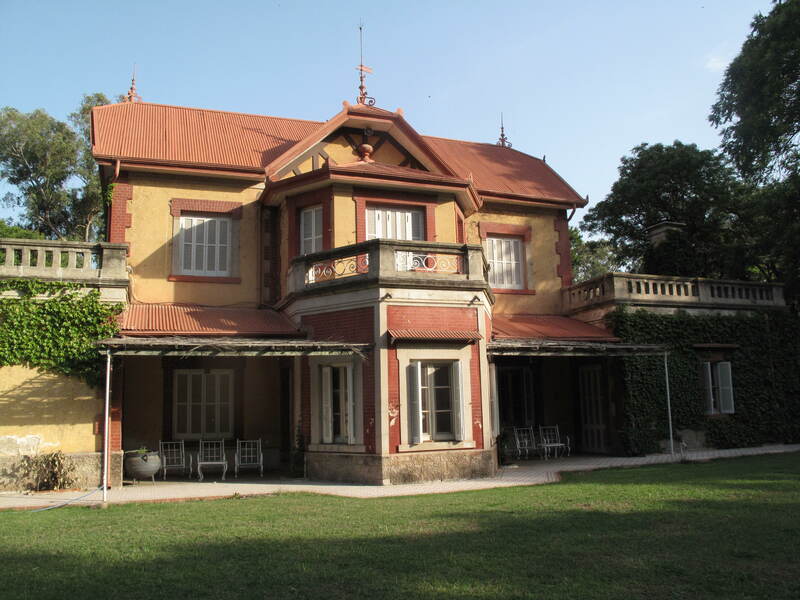 This estancia house, owned by a family friend of Carolina and Alejandro, has been kept in perfect condition. Which gives some idea of the kind of culture that is being left behind. While this policy satisfied the public’s meat hunger, it was a blow to the hard-working and proud cattle ranchers who saw their incomes plummet. On top of the change in domestic beef prices, farmers were also taxed at a higher rate than other citizens. Carolina told me that farmers feel taken advantage of by their government. In Argentina farming and ranching are proud traditions and that people who farm are not only hard-working, but truly enjoy their work. When faced with the actuality that they could no longer thrive by raising beef cattle, many ranchers had to make some unwelcome decisions. If they wanted to continue to farm, they would likely have to start raising other crops that would provide them with a better income. Farmers that could grow the best grass could also grow the best corn, wheat, or soy. Faced with a stark economic future as beef farmers, many ranchers converted part or all of their property to raising these commodity crops. The decision to quit cattle and turn up the beautiful pampas grass for dry land crops was done reluctance by many, who also felt resentful toward the government who not only created a bad beef market, but also continues to take their tax money and fund the welfare system with it. Multinational agriculture companies like Monsanto were only too happy to encourage these economically vulnerable farmers to buy their seeds and sprays and invest in the army of massive farm implements: combines, sprayers, and the like, which are necessary for growing commodity crops. This shift in agriculture has occurred in only the past 10 to 15 years and it has transformed the Pampas from a sea of grass, cattle, and gauchos into a patchwork of corn, soy, wheat and abandoned estancia houses. In Santa Fe, those who still choose to raise beef do so because they like cattle and the lifestyle, not because beef cattle are their main income. Freddy Covernton, a friend of Alejandro and Carolina, owns this herd of short horn cattle. His grandfather was the first to bring short horn to this area. Now Freddy manages the heard partly as a hobby. But Argentina is still a major beef producing country, so where’s the beef? Today most cattle ranches are in areas where the soil is too poor to make crop farming profitable but where cattle can still make use of the land. 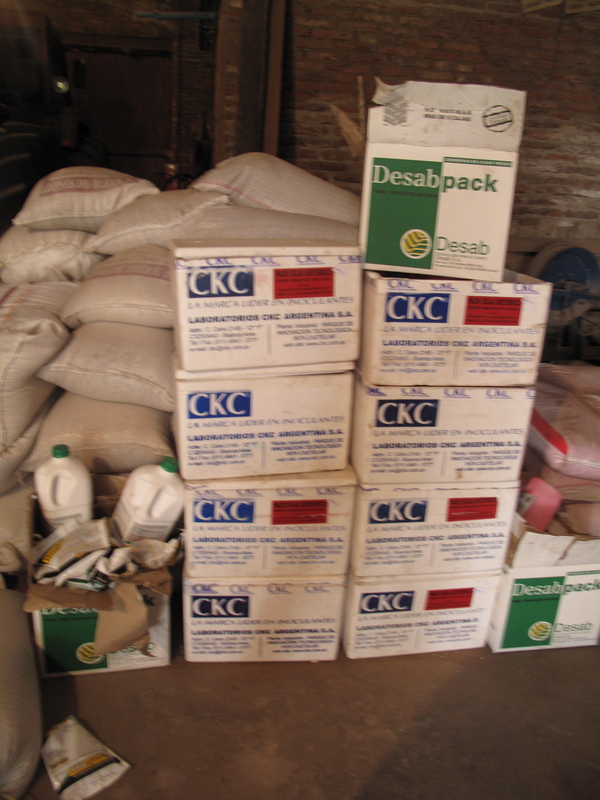 The poor quality feed can easily be supplemented with grain. This is the reason Alejandro owns a cattle ranch in the province of Cordoba, which does not have as wet a climate or as rich a soil as the province of Santa Fe. He feels it is necessary to supplement his pasture’s grass with corn silage and has even invented his own system of feeding it to his cattle. Instead of the silage being delivered to feed troughs using a tractor, Alejandro brings his cows to the silage pile (which resembles a giant bread loaf) and manages his cows’ access to the silage with a series of hot wires. Carolina says that raising cattle in new areas has brought jobs and money to different areas of Argentina and has been a boon to some communities. This also explains why areas like Esteros del Ibera, where I stayed at la Union Estancia, has remained a popular place to ranch, even though the grass is so tough that they fit the breeding stock with metal dentures to ensure the cows live three to five years longer than they might otherwise. Yes. Cow dentures. A dentist comes out and takes molds of the cows’ teeth and fits them with dentures when the time is right. When my friend Pablo presented me with a set of cow dentures he told me that when cattle have to chew rough grass all day it doesn’t take long for their teeth to wear out. To the committed Argentine rancher and steak eater, cattle dentures make perfect sense in the grand scheme of things. This is just for the breeding stock. The rest of the cattle become steak before their teeth wear out. Can you tell which cow has dentures? All of this for the love of steak. To the conniosseur of grass-fed beef will mourn the passing of the grass-finished steer and the Pampas that created it. Today it is no longer the case that you are insured eating 100% grass fed beef when you visit Argentina. This change in the beef industry has far-reaching consequences which may not out weigh the benefits. 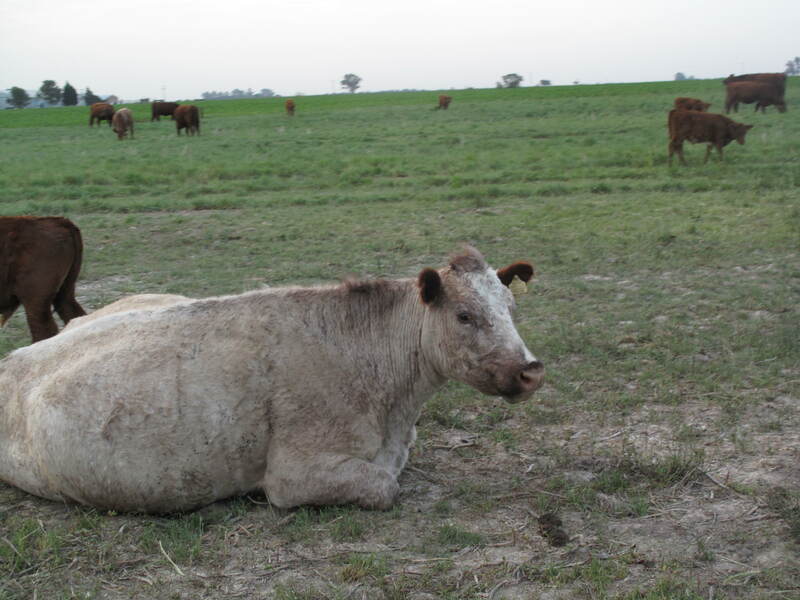 The conversion of cattle from 100% grass fed to lower quality grass with some grain affects the flavor of the meat. Most beef connoisseurs argue that properly raised grass-fed cattle are by far the tastiest, despite the general perception that corn-fed beef is better. Feeding cattle corn and soy also effects the type of fat present in the meat – grass-fed beef is higher in desirable omega three fatty acids – the healthy fats present in avocados, wild salmon, and olive oil. Grain fed beef is high in omega six’s which is a vegetable based fat that is unhealthy when out of balance with omega three fatty acids. Research has shown that the proper ration of omega 6 to omega 3 fatty acids is around 4 to 1. On average, grass-fed beef has a ratio of 3 to 1. The average American has an omega 6 to omega 3 ratio of 15 to 1, testament to our extensive use of government subsidized commodity crops in present in nearly every processed food and fed to every factory farmed animal. Argentine’s love of steak has influenced the historical, political, ecological, and personal destinies of the country and its inhabitants. There are also fewer people raising beef in Argentina and every year less and less cattle are being raised. A few years ago, there was a “bump” in the supply of beef, which the government was proud to report, but as my friend Pablo explained to me this influx of beef was a result of ranchers selling their breeding stock as they downsized their herds or got out of the beef business all together. In the future this would mean fewer cattle would be raised and less beef would be sold. While the export beef business remains strong – Germany buys the majority of it – the domestic beef market is not faring well. The price of beef is increasing regardless of government interference to keep the cost low because now Argentina has to import beef from neighboring Paraguay and Uruguay. The policy that would ensure that the price of beef would stay low in Argentina has eventually created the opposite effect. When I was traveling in Argentina, the price of beef was high, “As high as it has ever been,” I was told. 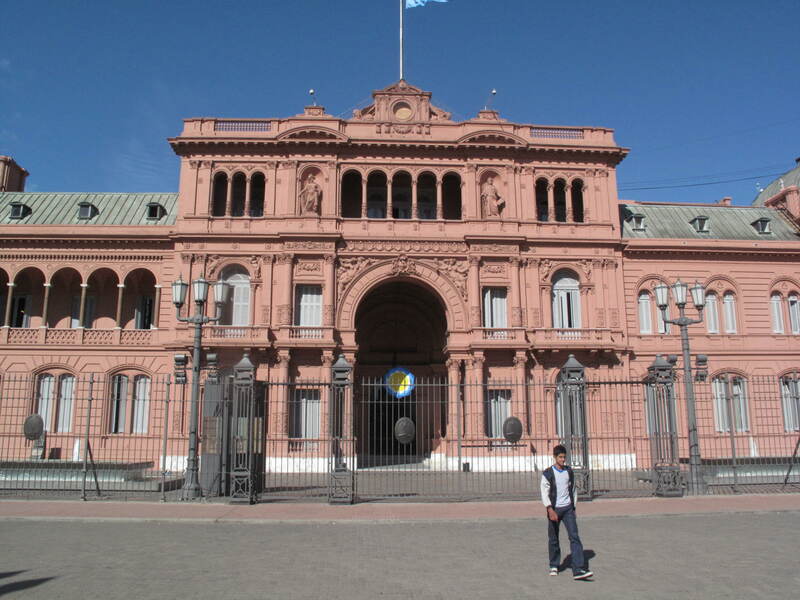 It is symbolic that Argentina’s famous pink capitol building – from which Evita gave speeches from the balcony – was originally dyed pink with ox blood (originally used to make the paint). I asked the pragmatic cattle breeder Diana, who I met at the Rio Quarto Angus cattle auction what the future of the beef industry looked like. She told me that in the future beef is going to cost more and people are simply going to be eating less beef all together, “I’m sorry, but that is the reality of it.” And that shrinking quantity of steak is likely to be grain fed. According to Mark Shatzker, the author of Steak, One Man’s Search for the World’s Tastiest Piece of Beef, eighty percent of Argentina’s beef will be grain finished in the next ten years. And so Argentina enters the modern age of beef where grass-fed cattle are rapidly becoming an endangered species. This entry was posted in Argentina and tagged Animal Welfare, Argentina, Beef, Food Policy, grass-fed, Healthy Fats, Travel. Bookmark the permalink.